I need a dentist! Today we had a 7 hour bus ride to Pokhara on a fairly comfortable coach. Our day started at 5:30 with a quick breakfast and then a taxi ride to a busy road where about a dozen coaches were waiting to leave. 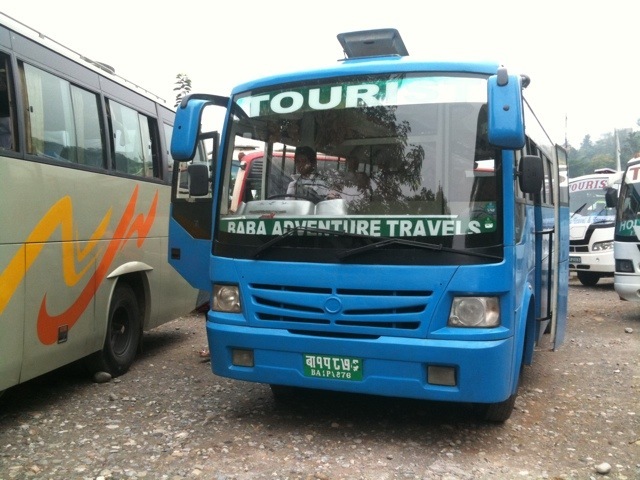 We eventually found ours which was run by Baba Tours. I’m not sure if this refers to Ali-Baba, Chris Barber, the Barber of Seville or the Japanese word Baba which means Granny but amazingly it left at exactly 7 o’clock and then headed off into the Kathmandu rush hour. It was scary! The driver was hitting the horn constantly, weaving in and out of the traffic and displaying more moves and tricks than Michael Schumacher. We climbed higher and higher out of the Kathmandu Valley but the morning was cloudy and the view over the top wasn’t very good. 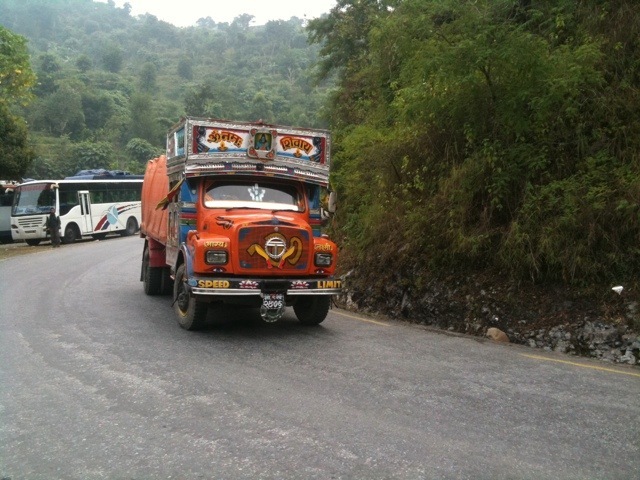 The main road to Pokhara (Nepal’s second city) was barely two coaches wide and frequently potholed. Our driver continued his racing driver moves in the Tata coach; his main technique was to drive right up to the vehicle in front, sound the horn and then buzz around the back until the vehicle yielded. Oh what fun! We rattled our way onward passing through countless small villages which all had tiny shops selling drinks, snacks and other necessities. We stopped at about 10 for a small snack stop during which one of the wheels was changed! I expect the tyres, brakes and suspension take a real hammering here. Lunch (which was included in the price) took place at 12 in a nice roadside restaurant. It was curry and rice. 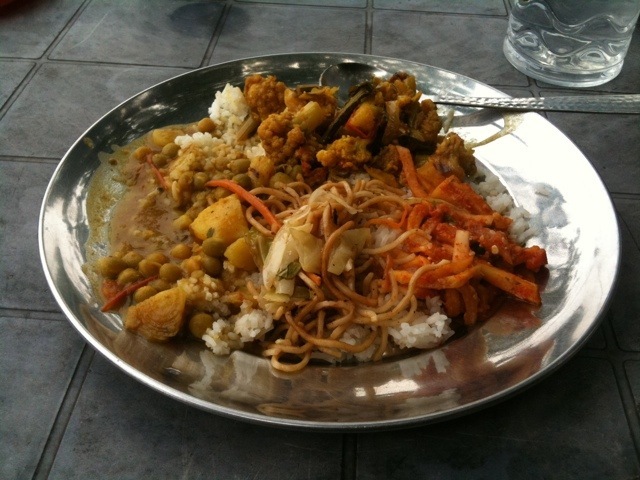 Nepalese curry. It was hot. Julian and I drank a litre of water between us during the 20 minute meal. If things carry on this way we’re gonna be a lot thinner by the end of the holiday. The coach rattled on for another 2 hours by which time Julian and I weren’t feeling ill but just thinking that we never need to go on a roller coaster ever again. And so we arrived in a coach park and were immediately surrounded by the usual pack of taxi drivers and in the distance a group of men holding signs for hotels. While I was retrieving our luggage the man from our hotel approached us and showed me a piece of paper with my name on it. That’s more like it! I realised later that he must have recognised me because I was the only person off the bus with a 9 year old boy behind him. This must be what the parents of famous children feel like. There were two other people going to the same lodge and we all squeezed into the smallest taxi imaginable for the 5 minute ride to the hotel. The good news is that we got upgraded to a deluxe room. The bad news is that we have to move to a standard room tomorrow. It does mean that we have a bath tonight and we have already made use of it. That was a good idea. A very good idea. And so now we are in Pokhara and just off to look for a porter, some food, some more trekking gear and a cool drink. I’ll leave you to work out what order we’re going to look for that little list. Just sounds really fun! Adventure! Feel like I’m there though. Food,Hotel,buses… I’m sure you have more and more fun memories! At times I really wish you were here and not me!! But we are doing OK and this hotel is nice. Our hotel man said that tomorrow it will be fine and we should have good views of the mountains. I’ll try and send a photo tomorrow but we are planning on a lie-in. We’re supposed to be on holiday, you know but every morning we’ve woken up before 6:30!!! It’s nice to getting up early morning and I’m very looking forward to seeing your photos ! Good morning, Andy and julian! My second son went to school just now! By the way,when my family looked your pictures, my two sons said ‘It’s not curry, it’s YAKISOBA!!! You could enjoy various taste with one plate. I’d like to eat this curry once. Yes, well done. It was just like yakisoba. It was the only thing on the plate that didn’t hurt! imagination. Did you both sleep at all in the coach? How would you like a good pint and steak pie in an English Pub? One of Julian’s talents is being able to sleep anywhere. I slept a little. I ALWAYS want to be in an English pub with a pint of beer!